Baseball fans look out as your world is about to collide with T-Mobile as the company announces they are the exclusive partner of the Major League Baseball association. T-Mobile will “provide technology that will enrich the MLB experience for both players and fans, inside and outside of the ball park.” The deal marks the first time in over 10 years that the MLB has partnered with a wireless carrier. Under the agreement, T-Mobile will provide the league with a new On-Field Communication System, powered by T-Mobile’s 4G network. The T-Mobile network will power a wireless voice system connecting managers in dugouts at select ballparks to coaches in bullpens and will roll out in 2013. The T-Mobile investment in baseball is a comprehensive, multifaceted marketing approach that will include partnerships with national broadcast partners FOX, Turner, MLB Network, and ESPN. T-Mobile will be the presenting sponsor of ESPN’s Wednesday Night Baseball, including on-air, digital and mobile sponsorship initiatives, in addition to features on ESPN’s Baseball Tonight. T-Mobile and MLB also will develop marquee media opportunities and marketing extensions at events throughout the year, as well as local sponsorships with select MLB Clubs. Currently, T-Mobile is a sponsor of the Pittsburgh Pirates and the Seattle Mariners. 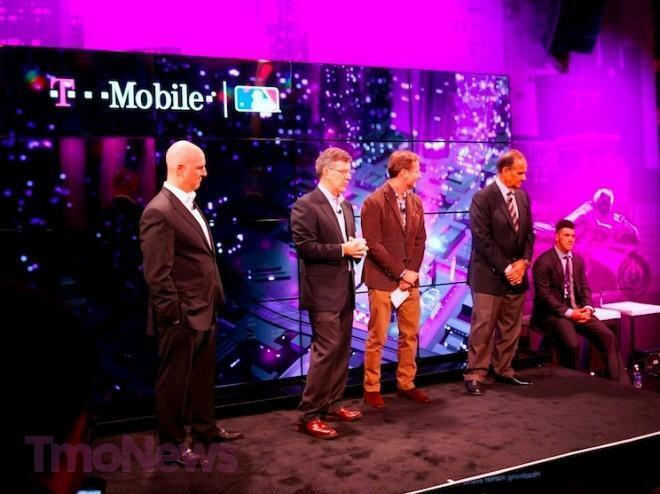 T-Mobile USA, Inc. and Major League Baseball (MLB) announced today at the 2013 International Consumer Electronics Show that T-Mobile is now the Official Wireless Sponsor of MLB. As part of the multi-year, multimillion-dollar partnership, T-Mobile will work with MLB and its industry-leading digital media and technology company, MLB Advanced Media L.P. (MLBAM), to enhance America’s national pastime on and off the field with game-changing wireless capabilities. This marks the first time in more than a decade that MLB has partnered with a major wireless provider. Under the agreement, T-Mobile will provide MLB with a new On-Field Communication System, powered by T-Mobile’s powerful nationwide 4G network technology. The first use of this technology will be in a wireless voice system connecting managers in select Major League dugouts to coaches in bullpens. This dugout-to-bullpen system will start to roll out in 2013 and the new On-Field Communication System solution will offer greater mobility as well as options for future innovation within the game. In collaboration with MLBAM, T-Mobile also will tap the power of its nationwide 4G network, currently available in 229 metro areas, reaching more than 220 million people, to further enhance and broaden network coverage and connectivity for fans in MLB ballparks. This past season, MLB recorded its fifth-best attendance year in its long and storied history by attracting more than 74.8 million fans to regular-season games. In addition, MLBAM, which develops, deploys and distributes the top-ranked sports mobile application of all-time — MLB.com At Bat — will work with T-Mobile to enrich the digital experience on T-Mobile’s smartphones and tablets; create custom, compelling content exclusively for its customers; and develop promotional opportunities and unique offers for MLB.com content. “Baseball is America’s No. 1 digitally consumed sport, and today’s baseball fan is technologically savvy and data hungry, which makes this partnership a great opportunity for not only baseball enthusiasts, but also millions of T-Mobile customers,” Sievert said. I guess they thought it was a big deal. Not sure it is relevant to their customers. The image may be what’s important. If Major League Baseball thinks we are good enough, you should too. This is sooo freaking huge guy. T-Mobile’s face will be tatted all on there tv’s, rv’s. teepees… Needed something that rhymed :/ but yeah this is great. But I thinking this must have cost them more than the iphone subsidized would have cost? But what do I know, I broke a shoelace this morning. Well considering Tmobile also signed a contract with apple you can look forward to the iPhone shortly. I don’t want an iphone, I hate that thing. I simply said it would be as expensive “AS IF” they did get SUBSIDIZED iphones. They have a deal with apple but not a subsidies deal so it would cost them billions like it did Sprint. I’ll say it again….Baseball starts in Feb, with opening day end March/beginning of April, so that’s February THROUGH October and on to mid November. Talk about monster deal. Every year, for the next 10 years. And Looks whats happening with the Dodger Stadium as we speak, Its going through some major face lift changes, which includes state of the art wireless Mobile experience within the ball park grounds. However, its not confirmed if Tmo will be the picked carrier, but this is becoming a home run as the ball drops. Great move, T-Mobile. Leave the NBA to Sprint, the NFL to Verizon and AT&T. Great job standing out from the crowd. I’m loving all this great news from T-Mobile today. Bring it on, Magenta, keep the competition on their feet. I just hope the ads aren’t as dumb as the Verizon NFL ads. What are you smoking? Verizons commercials… wait you said ads. nevermind. I hope there’s service in Metz, France otherwise this is silly. I’m not sure about Budapest, but Wien (right by St. Stephan’s Cathedral) has good coverage, and Vatican City does too. Baseball is Vatican City to Budapest to Wien to Metz back to Vatican City. The Homerun wall is the great wall of China and the Berlin Wall was supposed to be part of it. The Saffredi opera house is the pitcher mound. Deutsche Telecom’s founder’s “big brother” (Great, great Grandfather) should be in a commercial. Ok,now this makes SO much sense. BASEBALL is on, about 10 months out of the year. Talk about power move. As a big Cubs fan and with T-mobile for 9 years. I wonder if this will get us exclusive content, like maybe At-bat app for free or a discount for MLB tv. This is going to be big for T-Mobile either way. great deal for both companies!! !,l love it,amazing..
Glad to see them doing something; first the Glee product placements, and now MLB. I’m hoping for Really Great Signal the next time I’m at Fenway! i can see t-mobile coming out with some great commercials with this. cant wait to see some sweet mlb apps on my phone, i just recently moved to san diego and have been going to the padres games, this is big for magenta.